The number one struggle for my clients is getting a healthy homemade dinner on the table on busy weeknights. They know how to cook, they prefer to eat in, they want healthy (and delicious) dinners, but do not have the time or energy to pour over recipe blogs and cookbooks to find quick and healthy meals, much less plan a whole month of dinners, grocery lists and all. 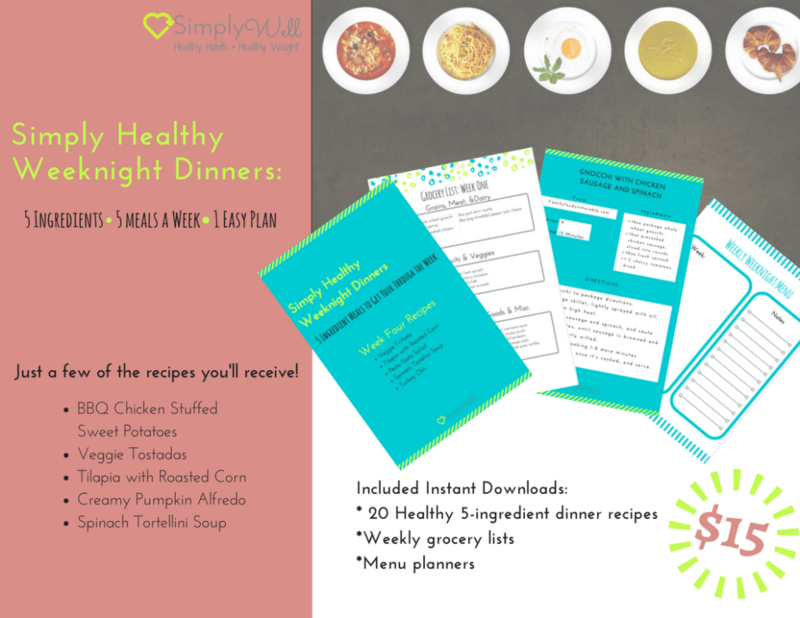 That is exactly why I created the Simply Healthy Weeknight Dinners plan. I did the recipe vetting, weekly meal planning, and grocery list writing for you, and it’s all in one place. Each recipe is a tasty balance of complex carbs, healthy fats, and lean protein from real foods. But, most importantly, no recipe has more than 5 ingredients. Are you ready for a month of healthy cooking minus the stress? Then this month of healthy meals is for you!